Be the first to share your favorite memory, photo or story of Aundra. This memorial page is dedicated for family, friends and future generations to celebrate the life of their loved one. 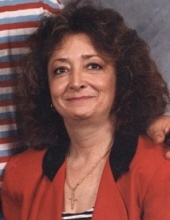 Aundra Kay Nickell age 64 of Pikeville, Kentucky passed away Wednesday, October 17, 2018 at her home. She retired from Pikeville Medical Center in the Medical Records Department. She was a member of the Boldman Free Will Baptist Church. Aundra was born in Williamson, West Virginia on January 15, 1954 the daughter of Eugene Trout and the late Jean Ford Trout. Along with her mother, she was preceded in death by her son, Geffory Brent Nickell. She is survived by her father, Eugene Trout and one brother, Gary Trout of Pikeville. She is also survived by a host of family and friends. To send flowers or a remembrance gift to the family of Aundra Kay Nickell, please visit our Tribute Store. "Email Address" would like to share the life celebration of Aundra Kay Nickell. Click on the "link" to go to share a favorite memory or leave a condolence message for the family.